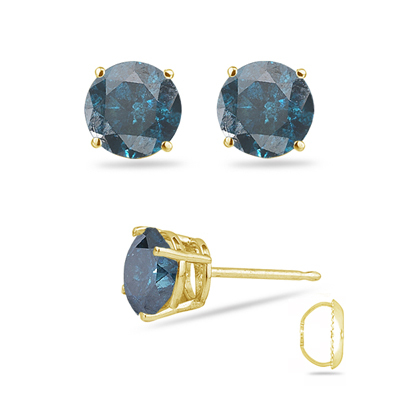 0.22-0.28 Cts Treated Teal Blue Diamond Stud Earrings in 14K Yellow Gold . These captivating Treated Teal Blue Diamond Stud Earrings showcase an entrancing Treated Teal Blue Diamond each prong set in 14K Yellow Gold. Approximate Color Diamond Weight: 0.22-0.28 Carats. Stone Treatment method is irradiated. Make a style statement with these enticing earrings.